Supernova 2003gd was discovered on 12.82 June in the nearby spiral galaxy M74. From observations carried out using the ISIS spectrograph on the William Herschel Telescope, it was shown to be a type II–plateau (II-P) SN that was discovered about 87 days after explosion. A team of astronomers also observed its gradually fading light for several months using the Isaac Newton Telescope. The progenitors of type II-P SNe have long been thought to be red supergiant stars with initial masses greater than 8 to 10 solar masses that have retained their hydrogen envelopes before core collapse. This model accounts for the 2- to 3-month-long plateau phases seen in the lightcurves of SNe II-P, the existence of hydrogen P-Cygni profiles (which are indicative of an optically thick expanding atmosphere) in the early time spectra, and the estimated physical parameters of the expanding photosphere such as velocity, temperature, and density. Stellar evolutionary calculations are consistent with this picture, in which stars with initial masses in the range of 8 to 25 solar masses reach the end of their nuclear burning lives when they are red supergiants. Only two progenitors of unambiguous SNe have been directly identified and yielded estimates of luminosity, temperature, and mass. These are the progenitors of the peculiar type II-P SN 1987A, which was a blue supergiant, and the IIb SN 1993J that arose in a massive interacting binary system. The expected red supergiant origin for the common type II-P SNe has so far eluded direct detection. The fortuitous coincidence of a type II-P SN occurring in a nearby galaxy that has high-quality prediscovery images available has allowed the direct determination of the physical parameters of a SN progenitor for only the third time. 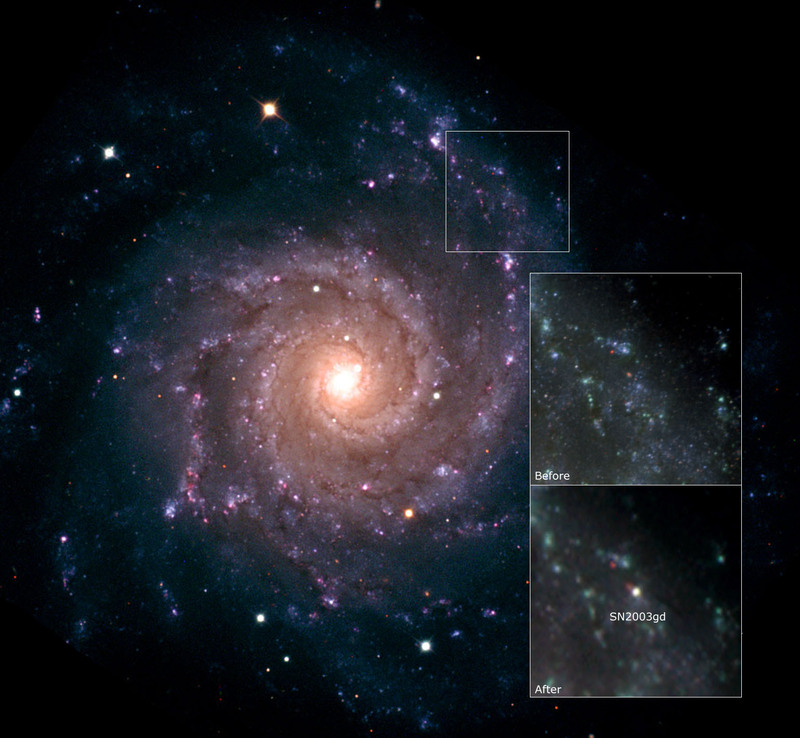 The galaxy M74 was observed with the HST about 200 days before the estimated explosion date of SN 2003gd of 18 March 2003 (with an uncertainty of about 21 days). This galaxy was also observed about 310 days before the explosion by the Gemini Telescope. An approximate position for the SN was estimated from images obtained using the Auxiliary Port Camera of the William Herschel Telescope and precise differential astrometry from HST images. Astronomers identified an object in the pre-explosion HST and Gemini images that is coincident with SN 2003gd. This is the first detection of a progenitor star from a normal type II-P SN, which is the most common type of SN (by volume) in the Universe. It is a red supergiant, which is consistent with the models of single stellar evolution. Recently, there have been attempts to identify the progenitors of three nearby type II-P SNe by the same method as followed with SN 2003gd. Although these have failed to detect an object, they have been able to set restrictive upper mass limits. Mass limits of the progenitors were estimated to be 15 solar masses for SNe 1999em and 2001du and 12 solar masses for SN 1999gi. These three SNe and 2003gd are all spectroscopically very similar and appear to be a common, homogeneous class of type II. Stellar evolutionary models and theories of the SNe lightcurve and spectral evolution have long predicted that red supergiants should be the progenitors of SNe type II-P. However, there is a quantitative discrepancy now appearing between the masses that have been derived for these four SNe II-P and the mass required to support the long plateau phase with normal expansion velocities. Consistently high ejecta masses have been derived for a large sample of 13 SNe II-P in the range of 17 to 56 solar masses, quite different from the low masses that the direct method suggests. However, the three SNe with excellent monitoring data and direct mass limits do show agreement, which is strong evidence that the common type II-P SNe originate in stars with masses between 8 and 15 solar masses. Several mechanisms have been proposed for the formation of these rings. They include binary interaction, magnetic activity cycles, or stellar pulsations caused by instabilities in the hydrogen burning shell inside the AGB envelope. Another possibility is that gas is ejected smoothly from the star, and rings are created later on due to formation of hydrodynamical waves in the outflowing material that are caused by a complex coupling between gas and dust. In any case, it is clear that any AGB mass loss theory should now confront the evidence that these rings are frequently found in PNe, and thus contain important information relating to the very late evolution of a large fraction of stars in the Universe. Kotak, R., Meikle, W. P., S., Smartt, S. J., IAU Circ, 8152. Maund, J. and Smartt, S., 2004, Frontiers, 19, 22. Smartt, S., J., Maund, J., R., Hendry, M., A., Tout, C., A., Gilmore, G., F., Mattila, S., Benn, C., R., 2004, Science, 303, 499. "Massive Old Star Reveals Secrets On Deathbed", PPARC Press Release, 26 January 2004.